Don’t Lose Your Benefits. Visit Your Dentist Today! The health of your teeth and gums is not only important to your smile, but your general health as well. To prevent complications from developing, you brush your teeth twice a day and floss each night. However, if you are not visiting your dentist every six months, you are allowing preventable issues to develop. While you may believe that you are saving money by not using your dental benefits until after a problem has occurred, you are actually increasing your long-term costs for care. As the end of the year approaches, now is the time to maximize the value of your insurance policy to keep your smile healthy. The American Dental Association recommends that everyone over the age of two visits the dentist twice a year for a cleaning and checkup. However, according to a Gallup report, one-third of adults did not schedule an appointment last year. 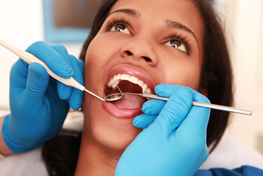 Often, it is believed that you do not have to visit the dentist until after an issue arises. As a result, you use your dental insurance as a backup plan incase a problem occurs. However, by doing so, you allow preventable complications to develop and increase your cost for care. Not only does this influence your dental expenses, but your medical ones as well as your oral and general health are linked to one another. In fact, it is estimated that the lack of regular dental care costs the U.S. healthcare system as much as $1.6 billion a year. While it is natural to be concerned about the cost of care, if you have dental insurance, you have nothing to fear. Your policy covers preventive appointments for a cleaning and checkup in full or for little to no out-of-pocket cost twice a year. In addition, you are given a yearly allowance to use toward treatments and procedures after you have paid your deductible. However, if you do not visit your dentist before the end of the year, your benefits will expire, and you will miss a large savings opportunity. At the end of the year, your dental policy expires. They will not carry over into the new year for accumulation and you will not be reimbursed for the monthly premiums that you have paid. To prevent your money from going to waste while getting the care you need for an affordable rate, now is the time to schedule an appointment with your dentist. As the end of the year approaches, take the time to keep your oral health a priority. Your dentist will help you maximize the value of your insurance policy to help keep your treatment within your budget. Darby Creek Dental is committed to providing exceptional dentistry to patients of all ages. Using state-of-the-art technology, we will help you achieve and maintain a healthy, beautiful smile. If you have any remaining dental benefits, contact Darby Creek Dental today to schedule an appointment before the year ends. Comments Off on Don’t Lose Your Benefits. Visit Your Dentist Today!